Karl Pilkington is God’s gift to the world. He makes me laugh 100% of the time he talks and sometimes even when he doesn’t. Above is a picture of his animated father from the Ricky Gervais Show where they usually make anyone related to Karl look just like him. This time is no different, just with a steesh and some gray hair. 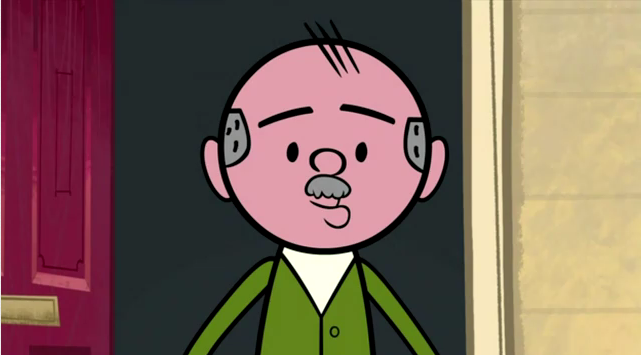 This entry was posted in Animated Steesh, TV Steesh and tagged Animation, cartoon, comedy, entertainment, gray hair, Humor, Karl Pilkington, Moustache, mustache, ricky gervais, TV on June 6, 2012 by Los Bulls. What a great blog site – who doesn’t love moustaches!!! Also, if you love moustaches, have you heard this: http://www.weebls-stuff.com/songs/Moustaches/ (So random, but makes me laugh).